Basil's Blog: Maybe people would listen if Obama said "I inherited this Democratic Senate"
Maybe people would listen if Obama said "I inherited this Democratic Senate"
Barack Obama keeps saying he inherited problems. And, the statistics show that, just maybe, he did. Look at this graph from the Bureau of Labor. 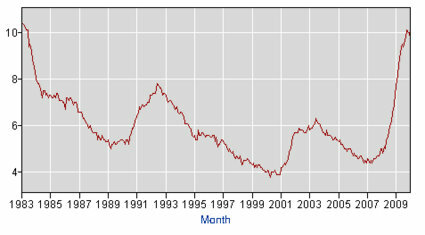 Notice that unemployment was on its way up before he took office. It looks like Obama did inherit rising unemployment. But then, take the statistics from this source -- the Unites States Senate -- showing which party controlled the Senate, and apply it to that graphic. So, when you go to criticize Barack Obama for his dismal performance, keep in mind that it's not just his fault. It's the Democrats' fault. And the fault of those that keep electing Democrats. It is not possible to hammer this point to death. This stat needs to be everywhere in the entire world, so the entire world can make it clear to the morons in the Democrat Party that the entire world does not appreciate Democrats ruining the economy of the entire world. 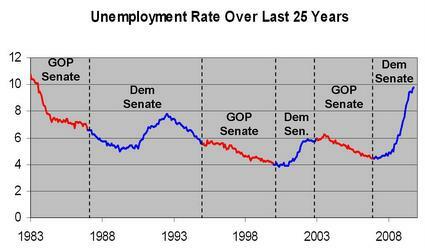 I missed it when American Thinker posted the Senate/Unemployment graph last year. They re-ran it today and teh Google Reader caught it for me. I know lots of people that voted Democrat that I really, really want to read this. Could you explain to me (or perhaps link to a webpage) why a senate controlled by democrats causes high unemployeement? Democrats pass bad legislation. Or hadn't you noticed? But to your point, I'm sure it's just a coincidence. I'm sure there's nothing to it. Just because it's been going on for as long as you've been alive... coincidence. Ignore the numbers. And be surprised when the numbers continue to show the same thing. It links the recession to a rise in shark attacks. Somehow I feel like this is related. Actually, it says that a decrease in shark attacks may be tied to the economy, because people can't afford to take as many trips, meaning fewer people in the water, meaning fewer people being attacked. You got the facts backwards. Say... you didn't vote for Obama, did you?